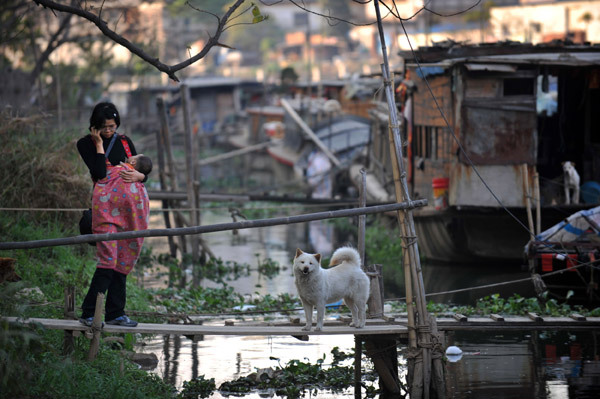 JIANGMEN, Guangdong - Keeping dogs will be banned in the urban sections of this Pearl River Delta city later this month. According to a public notice, local residents must resettle their pet dogs between Aug 10 and 25, while a special campaign will start on Aug 26 to remove all dogs from the city's Pengjiang, Jianghai and Xinhui districts. The Notice on Strengthening the Management of Dogs was jointly issued by the city's five departments and bureaus of public security, agriculture, urban comprehensive management, health, and industry and commerce. Only those who have applied for and have been granted certificates from the city's bureau of public security can keep dogs in the urban sections of Jiangmen, a prosperous city in the western part of the Pearl River Delta. According to a new regulation from the city's bureau of public security, only those who own or are partners in warehouses that store goods worth more than 5 million yuan ($775,200), oil depots, power plants, waterworks, warehouses for dangerous chemicals and other special venues can apply for certificates to keep dogs to help guard their properties. Even if approved, dogs must be kept in enclosed areas. They will also be required to have prophylactic immunization. From Aug 26, law enforcement personnel will start confiscating, catching and putting down all dogs that appear in public places, including streets and parks, in the urban areas, said a police officer from the Jiangmen city bureau of public security. "Our aim is not to kill all the dogs in the city's urban areas, but we hope to create a better environment for the city by banning the keeping of dogs," said a police officer, who did not want to be named, on Tuesday. "And we hope dog owners and residents can understand and cooperate with law enforcement personnel," he added. Gong Rongmao, a veterinarian from the Jiangmen city bureau of agriculture, said his bureau has established a special dog-receiving center that covers an area of more than 5.33 hectares. Located in a village, the center will start accepting dogs from local residents on Aug 10. "Rural residents can adopt the dogs from the center later. Sick dogs or those carrying viruses will be slaughtered and buried," Gong told local media on Tuesday. Jiangmen will become the first city in Guangdong province to ban dogs in its urban areas. The notice has sparked great controversy among locals. "That is not fair to the city's dog owners and does not respect life," said Wang Chengzhi, a Jiangmen resident. "The appropriate departments should introduce detailed regulations to guide residents in keeping dogs and grant them certificates, instead of simply banning dogs," he added. However, Yang Wenying, a white-collar worker, said it was acceptable that the city government bans keeping dogs in urban areas. "There are always some dog owners who do not obey the rules and cause trouble to others," she said.